For the past few weeks, my three kids (ages 2, 5, and 8) have been enjoying creating art with Kwik Stix 12 pk by The Pencil Grip, Inc. These solid tempera paint sticks have been a blast to use. They are smooth, easy to use, don't make a mess, and are easy to clean off little fingers. You don't have to mess with brushes or cups of paint and water either! You just take the cap off, twist the color up, and go to down! The colors dry in 90 seconds and leave a vibrant picture behind. They were easy enough for my 2-year-old to handle but versatile enough for my 8-year-old to enjoy using as well. 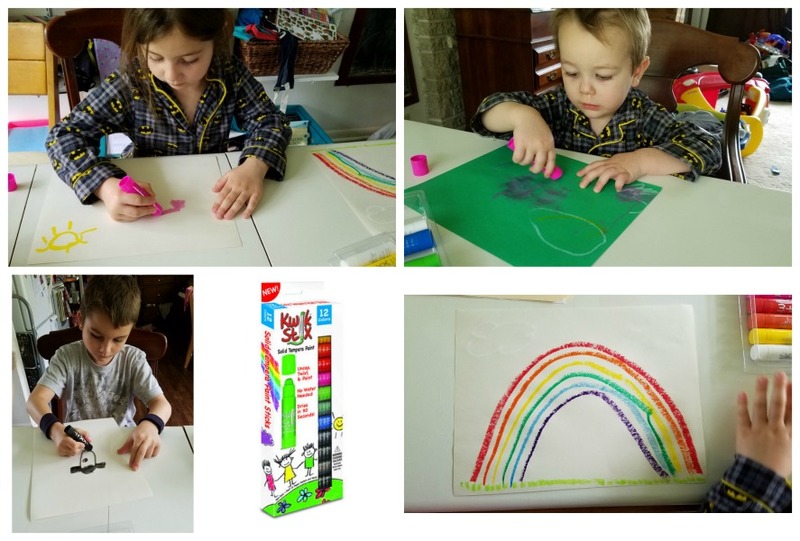 The kids keep going back to the Kwik Stix instead of crayons or markers because they are as easy as crayons but they are as fun as paint. They can pull them out and use them without needing my help getting things together. It is a win-win for us! Here are some of the pictures my older two kids worked on. They have stacks of artwork completed over the past couple weeks because it has been a favorite go-to activity in the house. I love how it keeps them busy for a long time at the table. It has allowed me to get dinner or lunch together, write a blog post, put school together, and it has been a great activity during sick days. They are just fun to use! The price is fantastic. You can find them online at Amazon for less than $12 with Prime Shipping. Although we didn't get to try them out, there are Neon and Metalix colored Kwik Stix, and I just might be ordering those to add to the collection. My 5-year-old girl LOVED them. "They are very useful and colors. It was like glue!" My 2-year-old enjoyed them as well because he was able to use them on his own without help. Any independent activity at that age is a win. My 8-year-old keeps asking to use them again and again for his comics he makes. Nothing. Seriously. These are a great product! They also sent us The Pencil Grip to try out. Miles liked how squishy it was, but he is too young to use it yet. I did try it out myself as well as having Sebastian and Kaelyn try it out. It is easy to use, and I will have them both use it during handwriting practice to reinforce proper grip. Who would enjoy this product? Anyone who has kids, likes to color, is a crafty person, or watches kids would enjoy this product. I think Kwik Stix might even make some kids that don't like to color converts! There are few different Pencil Grips for kids that need help in different ways. I wish I would have had one for Sebastian a few years ago because we struggled with grip in the beginning with him. Kaelyn holds the pen more naturally so I don't think the grip is as necessary for her as it would have been for Sebastian. 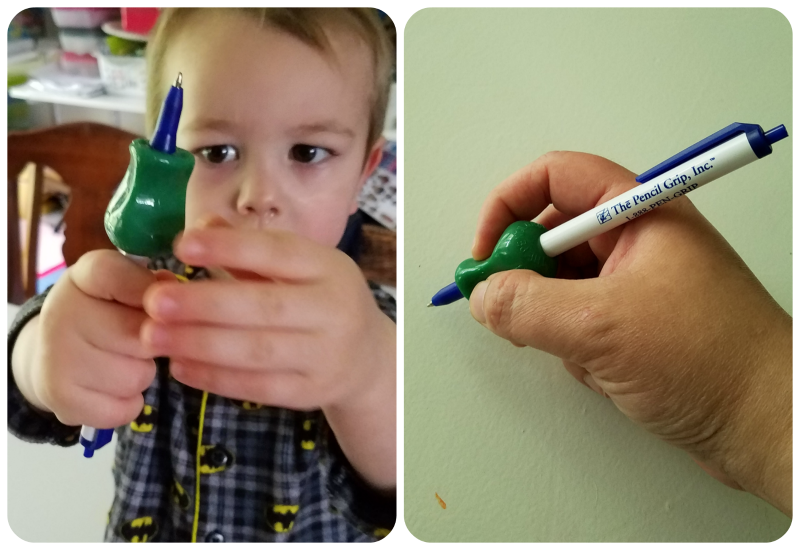 The Pencil Grip would be great for those beginning writers as a comfort and reinforcement tool.